Newark housing in the second half of the 20th century has been affected by three powerful agencies dedicated to providing good homes for Newarkers: The Newark Housing and Redevelopment Authority, the nation’s eighth-largest housing authority; The New Community Corp., the state’s largest nonprofit home builder and one of the nation’s largest nonprofit housing agencies, and Society Hill of K. Hovnanian, said to be the largest inner-city low-rise housing development ever in New Jersey. 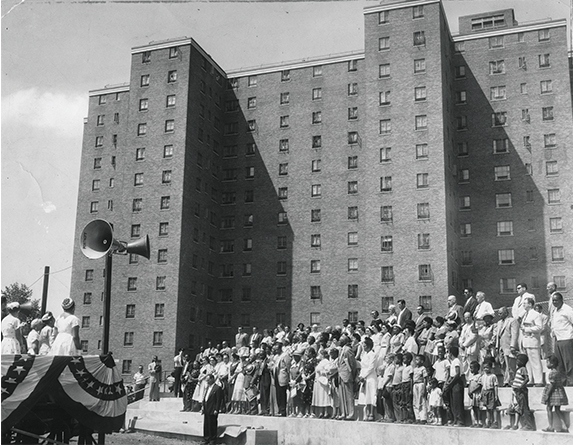 The Newark Housing Authority was created in 1937 under the Federal Housing Act and put into motion by the Newark City Commission on April 27, 1938. In November 1938, the city approved the first contract with the federal housing authority to build low-rent housing for the poor. The buildings were paid for with temporary loans and bonds issued by the housing authority. Built first were Seth Boyden Court, Pennington Court, Baxter Terrace and Stephen Crane Village. William Hyatt Court and Felix Fuld Court were diverted to housing for World War II workers. The Joseph P. Bradley Court was built as a federal housing development for war workers, and taken over by the city for rental housing in 1950. At that time, to be eligible for admittance, a two-person family annual income had to be below $1,800. In 1945, Mayor William Murphy broke ground for 275 new units on Chapel Street, creating the Franklin D. Roosevelt Homes. They are now the Millard D. Terrell Home. In 1946, the Newark Housing Authority consisted of a chairman and four members, each appointed for five years by the city commission. By that time, the authority was providing housing for 11,700 people and had become a veritable 'city within a city.' The authority was an autonomous agency. The commissioner’s actions were reviewed by the Federal Public Housing Authority, which supplied technical advice, loans or portions of capital funds, and paid annual contributions to aid in achieving low rents. The authority was divided into an accounting division, legal division for finance and tenant problems, a maintenance and construction department with a staff for building mechanics, plumbers, carpenters, bricklayers and painters. A director of services was in charge of management services. The authority’s projects included: James M. Baxter Terrace, opened in 1941 and named for James M. Baxter (1864-1909). Baxter was the principal of the Colored School in Newark at James, Nesbit and Orange streets. Seth Boyden Court, opened in 1941, was named for Seth Boyden, (1788-1870), the Newark inventor of malleable iron, patent leather and a number of inventions that aided Newark’s industrial revolution. The project is located at Frelinghuysen Avenue, Center Terrace, Dayton Street, and Seth Boyden Terrace. Joseph P. Bradley Court was a federal housing development built in World War II and taken over by Newark as a housing complex in 1950. Bradley, a U.S. Supreme Court Justice, lived from 1813 to 1892. Christopher Columbus Homes opened 1955, replacing housing and stores in the old Italian First Ward. It was located between 7th Avenue, High and Sheffield streets. Stephen Crane Village opened in 1940. Named for Stephen Crane (1871-1900), author of the 'Red Badge of Courage,' it is located on Franklin Avenue at the Newark city line. Felix Fuld Court, opened in 1942, is named for Felix Fuld (1865-1929), the business partner of Louis Bamberger. Fuld was a civic leader and philanthropist. The complex is located at Livingston and Rose streets and Muhammad Ali and Jelliff avenues. Rev. William P. Hayes Homes, opened in 1953-54, was named for the Rev. William P. Hayes (1883-1963), a well-known Newark clergyman. The homes were at Hunterdon and West Kinney streets, 17th Avenue and Irvine Turner Boulevard. John W. Hyatt Court, opened in 1942, was named for Newark inventor John W. Hyatt (1837-1920). It is located at Hawkins Street and Horatio Court, Roanoke Avenue and Vincent Court. Otto E. Kretchmer opened 1953. The homes were named for Otto E. Kretchmer (1887-1950), president of the Peerless Imperial Co. and a member of the Newark Housing Authority. The complex is at Dayton and Ludlow streets. Pennington Court opened in 1940. Named for a prominent early Newark family, it is located at Pennington and South streets. Franklin D. Roosevelt Homes (now Millard D. Terrell Homes) opened 1946 and is located at Riverview Court, Place and Terrace in the city’s Ironbound section. Edward W. Scudder Homes opened in 1959 and 1960, was named for Edward W. Scudder, (1881-1952), publisher of the Newark News from 1931-1950. It was located between Rose Court, Howard and Lincoln streets. Archbishop Thomas J. Walsh opened in 1953. Named for the archbishop of the Newark diocese (1873- 1952), the complex is at Grafton Avenue and McCarter Highway along the Passaic River. Stella Windsor Wright Homes opened in 1959-60, and is named for a prominent Newark African-American social worker who died in 1931 at 48. She helped found the Friendly Neighborhood House in 1926. New Community is the largest nonprofit housing corporation in New Jersey and one of the largest in the nation. It was created by a concerned group of people in the Central Ward to 'provide quality of life to the people of Newark and to reflect individual dignity and personal achievement.' New Community’s mission is to 'offer dignified and affordable housing, a safe neighborhood, quality health and day care, creative education programs, mutual awareness of the value of a faith life, and neighborhood economic opportunities.' The corporation operates 10 housing developments in Newark with 2,500 units for more than 6,000 tenants and provides an impressive array of social services as well. It also is in charge of the Convent of the Little Sisters of the Poor and the Douglas Hotel, used as apartment units for senior citizens. New Community also obtained the Douglass-Harrison Homes, which it now operates. With the Bellemead Development Corp., NCC renovated an apartment house on Sussex Avenue. NCC and Hartz Mountain Industries built Harmony House for homeless families. In 1988, the New York Times said of the agency and its founder, Monsignor William J. Linder, 'None was more successful than New Community Corporation and its president, Monsignor William J. Linder. Generally regarded as one of the most productive community groups in the nation, NCC is involved in 2,300 housing units in the West and Central Wards.' In the process of building or maintaining its housing developments, NCC created more than 8,000 construction jobs for projects that exceeded $200 million and produced $30 million in construction wages. Completed projects include Babyland III, a day care/office center at 200 South Orange Ave. and the New Community Federal Credit Union, opened with funds in excess of $1.5 million. NCC renovated the old St. Joseph’s Church at 233 W. Market St. for $2.5 million and put it into use again by offering commercial office space, a spa, medical facilities and a restaurant. The Extended Care Facility was completed in 1986. The next year it took over a homeless job training program. Babyland projects included counseling for teenage parents, a Parent and Child Center for children with AIDS and the opening of its 10th housing development, Harmony House. The NCC Pathmark Shopping Center serves an average of 50,000 mall shoppers weekly. It serves the University Heights area and Society Hill, which adjoins the area. So successful have some of these programs proved that other NCC facilities have opened in Englewood and Jersey City. On December 1, 1987, ground-breaking took place at 13th Avenue near Boston Street for what was called 'the single largest inner city low-rise housing development ever started in New Jersey.' ‘‘With the ground-breaking we truly herald the beginning of housing revitalization for our entire city,' Mayor Sharpe James said at the dedication ceremony. In an effort to revitalize Newark and other American cities, the Affordable Housing Program created by HUD was put into play, earmarked by a cooperative effort between developers and communities. Society Hill’s 40 two-story red brick townhouses marked another attempt at the rebirth of the inner city, first with the two streets of independent townhouses and then the larger development of what would eventually be 1,065 condominiums. The garden-style buildings bear a slight resemblance to two-story brick row houses in Philadelphia. In 1987, the basic cost ranged from $58,000 for a 558 square-foot one-bedroom unit to $98,000 for a 1,445 square-foot three-bedroom with 2 1/2 bathrooms. Vogue Housing Connection Inc. was co-developer of the first 40 homes along Boston and Richmond streets. The success and excitement of these houses led to the larger community known as Society Hill in several sections by K. Hovnanian, the nation’s second-largest developer of attached homes. At the Vogue houses, the external care and taxes are the responsibility of the individual property owners. At the Hovnanian complex, a monthly maintenance fee covers these expenses. Completely sold out and attractively maintained, both the town houses of Vogue and the condominiums of Hovnanian have transformed a portion of the Central Ward into a showplace that has won several awards for design and livability. The Society Hill townhouses, built in the late 1980s, have transformed a portion of the Central Ward into a showplace that has won several awards for design and livability.